This article's current status is disputed. This article has been given a rating in the past but may not meet the current requirements for this status. Please help to improve this article until it meets those requirements. 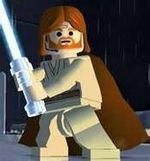 LEGO Star Wars: The Video Game is a video game based on the Star Wars themed toy line by the LEGO Group that takes place during the prequel trilogy (The Phantom Menace, Attack of the Clones and Revenge of the Sith), with a bonus segment from A New Hope. LEGO Star Wars: The Video Game was first released on April 5, 2005, a full month before the final Star Wars film premiered. It features many homages to the Original Trilogy, including a reference to the X-wing levitation sequence in Star Wars: Episode V: The Empire Strikes Back. Even though the characters don't speak, they grunt. The game was developed by Traveller's Tales for the Microsoft Xbox, Sony PlayStation 2 video game consoles and Microsoft Windows PCs, with Griptonite Games developing the Nintendo Game Boy Advance version. These initial versions were published in April 2005. A Macintosh port, developed by Aspyr Media, was released in August 2005. A Nintendo GameCube version of the game was released on October 26, 2005. All versions were published by Eidos Interactive and LucasArts. 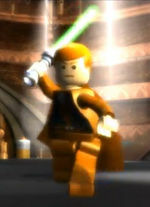 Though LEGO Star Wars was billed as a "kid's game", it received the "Game of the Year" award from Kidzworld.com, received positive reviews, and peaked at the top of the UK charts during early May of 2005. It later lost the spot to the official game of Episode III, but maintained a consistently high chart position throughout the month. A sequel, LEGO Star Wars II: The Original Trilogy, was released in September 2006, LEGO Star Wars: The Complete Saga was released on the 25th of November 2007, and LEGO Star Wars III: The Clone Wars released on March 22 2011. The Trade Federation has blockaded the peaceful planet of Naboo. The two Jedi Qui-Gon Jinn and Obi-Wan Kenobi are sent to negotiate. Their Republic Cruiser lands in the Trade Federation's capital ship's hangar; the protocol droid TC-14 greets them, and the Jedi are escorted to a small conference chamber, where they sense a disturbance in the Force (the Republic Cruiser is destroyed) and are set upon by several Trade Federation Battle Droids. They destroy the Battle Droids and find TC-14, who helps them through the ship. Upon discovering an invasion force headed for Naboo, Qui-Gon and Obi-Wan decide to board a Trade Federation MTT and meet down on the planet. They land on the planet and regroup. The Jedi travel through the swamp and find a Gungan named Jar Jar Binks, who takes them to the Gungan city nearby. The group arrives, and the Gungan leader Boss Nass gives them safe passage to the capital city of Theed. It is here that the Queen is being held by the droid invasion force. The Jedi rescue the Queen Amidala and her guard Captain Panaka, and they proceed to the Queen's hangar and escape the planet. The Royal Cruiser is damaged, warranting an emergency landing on the world of Tatooine. On Tatooine, a young boy named Anakin Skywalker said he could help them get the money for new parts. He offers to win the Boonta Eve Podrace for them and win them the money. He wins the Podrace, and Qui-Gon decides to bring Anakin with him, noting his extreme sensitivity to the Force. The ship lands on Coruscant, and Senator Palpatine becomes Supreme Chancellor of the Republic. Queen Amidala decides to return to Naboo and free her planet. On Naboo, Amidala recruits the Gungans to help the Naboo retake the planet. Meanwhile, the Space Fighter Corps destroys the main Trade Federation capital ship and knocks out the Trade Federation army. Darth Sidious's apprentice, Darth Maul, engages Obi-Wan and Qui-Gon. Obi-Wan defeats the Sith, but Qui-Gon is killed. He requests that Obi-Wan trains Anakin. Celebrations are held on Naboo, and peace between the Gungans and the Naboo people is proclaimed. It is ten years after the blockade of Naboo. Padme is now a Senator, and Anakin is Obi-Wan's Padawan. A bounty is put on Padme from the Trade Federation as revenge and Obi-Wan follows a clue left by a certain bounty hunter to the world of Kamino. In light of current events, he discovers a clone army being prepared for the Republic. He also encounters Jango Fett and his son Boba, but the two escape before he can question them. Obi-Wan follows them to the planet of Geonosis. He is set upon, and calls Anakin for backup. Anakin and Padme free Obi-Wan, but are captured by Jango Fett and a team of battle droids. Following a mock trial and execution, the group are rescued by Mace Windu and many of the Order's Jedi, backed up by the clone army. Count Dooku, the Separatist Leader, escapes. Obi-Wan, Anakin, and Padme pursue Count Dooku to a hangar. The two Jedi engage him, but Anakin's arm is lost. Yoda arrives and bests the Count, but Dooku stages a distraction and escapes in his ship. It is three years since Episode II, and the Clone Wars are in motion. In a stunning act of audacity, General Grievous, leader of the Confederacy's droid armies, has abducted Chancellor Palpatine from Coruscant. The Republic forces engage the Confederacy's invasion forces, with Obi-Wan and Anakin at the spearhead. They eventually find Count Dooku and kill him. The two Jedi rescue the Chancellor and confront Grievous, but he escapes. Obi-Wan pursues him to Utapau and, with the help of his clone commander, Cody, Grievous is slain. Meanwhile, on the Wookiee home world of Kashyyyk, Yoda and Chewbacca are on the front lines when the clones receive Order 66 and revolt against the Jedi. Yoda escapes the planet. He and Obi-Wan return to the Jedi Temple on Coruscant, where they find that Anakin has fallen to the Dark Side and killed every Jedi in the Temple. Padme, confused and upset, journeys to Mustafar to meet with Anakin. There Padme finally realizes what her husband has done and she states that he is "going down a path that she can't follow". Obi-Wan walks off the Naboo cruiser and consequently Anakin becomes enraged. Upset and angered, Anakin uses the force to choke Padme into unconsciousness. After a dramatic fight sequence between Anakin and Obi-Wan, Anakin is left for dead, severely burned and scarred. Obi-Wan Kenobi escapes and takes Padme to an asteroid field where a medical center is located. She dies, having lost the will to live. Anakin is fitted into a suit of black Sith armor and becomes Darth Vader. With the galaxy entering the Dark Times, Padme's twins are split up. Leia is taken to Alderaan, while Luke Skywalker is placed in the care of his aunt and uncle on Tatooine. LEGO Star Wars contains a total of 56 playable characters. The playable characters are modeled like actual LEGO parts (but with far more mobility) and are divided into groups according to certain skills. There are a wide variety of characters included in the game, all of which are unlocked by completing levels or by purchasing them at Dexter's Diner. Every character, other than the PK Droid, the Gonk Droid and Chancellor Palpatine, have a special ability, such as extra high jumping, control of the Force, or the ability to Grapple. Droids, while not being armed, can travel through the game unimpeded (ie. they won't be intentionally attacked by enemy characters); as well, protocol droids and astromech droids can open doors via special panels. Also, unlike other armed droids, player-controlled Battle Droids will be ignored by hostile Battle Droids, but not Droidekas. The Gonk Droid is also indestructible. 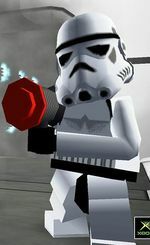 Unlocked characters can be imported into the game's sequel, LEGO Star Wars II: The Original Trilogy, by purchasing the extra, "Use Old Save", for 250,000 LEGO studs. 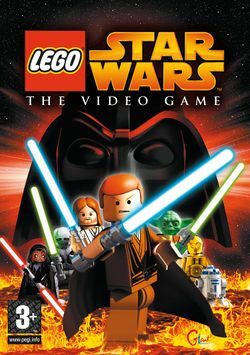 Because LEGO Star Wars is based on the Prequel Trilogy (Episodes I, II and III), Luke Skywalker, Han Solo, and other characters from the original Star Wars trilogy are not shown (excluding Princess Leia, who is a purchasable character once unlocked). This game was released before Revenge of the Sith, possibly driving sales up as the basic plotline was present in the game. To prevent inadvertent spoilers, however, most reviewers warned that this was the case in their reviews. Dexter's Diner is the area from which the player chooses what level to enter and view any vehicles whose parts they have found in any of the game's levels. LEGO Star Wars also has a feature called 'Free Play', which enables the player to play the same level again, but with the ability to switch between characters, thus gaining access to areas containing extras the player was unable to get before. In Free Play mode, a player may use any character they have unlocked. 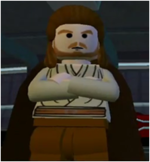 The player may also match up good and evil characters, such as Qui-Gon Jinn and Darth Maul. The Free Play option will only appear when the player finishes a level. Levels that are played in vehicles cannot be played in Free Play, but are able to be replayed in Story mode like the others. 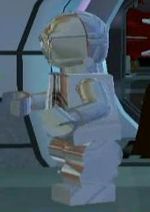 Some characters, such as Chancellor Palpatine, the PK Droid, and the Gonk Droid, cannot do anything but walk, although they are never attacked in the case of PK Droids and Gonk Droids, giving them the ability to traverse the levels unharmed. Also, in the Diner, players may purchase unlockable extras for studs. 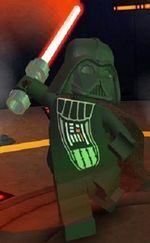 Each level in LEGO Star Wars loosely follows the various sequences from the Star Wars prequel films, with game play segments linked together by various cutscenes. There is no spoken dialogue; rather, the characters act out their parts using gestures and pantomime. The game begins with Obi-Wan Kenobi and Qui-Gon Jinn about the Trade Federation ship, and ends with Anakin Skywalker and Obi-Wan Kenobi's duel on Mustafar. In each level, a certain number of LEGO studs need to be collected (the number varies per level) in order to obtain a piece of the super kit. 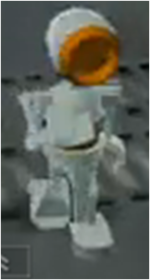 The player has to obtain the required amount of LEGO studs in one attempt. The studs can be collected in Story mode or Free Play mode. After all 17 kit pieces are collected, a fourth door, marked by a question mark, unlocks in the main room of Dexter's Diner. This room contains the bonus level, a short prelude into Episode IV: A New Hope, titled A NEW HOPE. This level is available for both Story and Free Play modes; however, there are no cutscenes, no mini-kit pieces to collect, no LEGO stud meter and no areas that can only be reached in Free Play mode. In the bonus level, the player plays as Darth Vader and an Imperial Stormtrooper (with the dubious addition of C-3PO), upon entering the Tantive IV Blockade Runner (which is also the model of the super kit collected to unlock the level). In the level, the player encounters a few Rebel Soldiers, and is capable of collecting over 100,000 LEGO studs. The level ends upon finding Princess Leia and R2-D2. A short message - To be continued... - follows completion of the level. 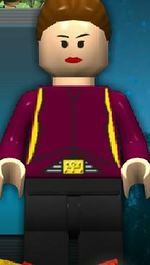 This is entirely different as opposed to the LEGO Star Wars II: The Original Trilogy Episode IV opening level, as the player takes the roles of Princess Leia and Captain Antilles in that game. In the ending cutscene for Episode I, Chapter 5, Padme has a silver pistol whilst in the level she has a standard blaster. (This goof is fixed by the opening cutscene of Chapter 6). In the opening cutscene for Episode I, Chapter 6, Padme is wearing her Tatooine outfit, not her Battle of Naboo outfit. Also, in the same cutscene, when Darth Maul backflips across a chasm, his lightsaber hilt is in his hand, but when he lands in the next frame, it is not. In the ending cutscene for Episode II, Chapter 3, Obi-Wan's borrowed lightsaber blade is green and Anakin's is blue even though they were the exact opposite in the level for both of them. In the ending cutscene for Episode III, Chapter 3, Commander Cody is defeated by General Grievous. In the ending cutscene of Episode III, Chapter 6, Anakin's lightsaber blade is red, not blue. This could possibly signify his transgression to the dark side. 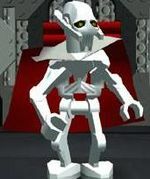 The game was originally going to include the Boga chase scene with General Grievous on his wheel bike, but since the game was released in 2005 before Star Wars Episode III: Revenge of the Sith was put into theatres TT Games decided that it would be too much of a spoiler, which made many Star Wars fans annoyed when the game was released. 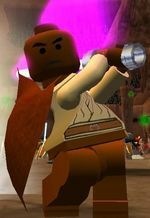 Unused and normally unplayable (and in some cases, unfinished) data exists for several characters in the coding of LEGO Star Wars PC and PS2 versions, including Zam Wesell, Zam Wesell's Speeder, ARC-170, the Kaminoans, Dexter Jettster, WA7, Pit Droid, a generic Spaceman, a generic Flying Saucer and a Jawa, which can be made playable (with varying results) by copying and renaming the data files in the 'Chars' folder. 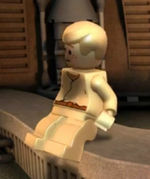 The game features some characters from the movies that have yet to be made as minifigures, Hospital Droid, and baby versions of Luke and Leia. Princess Leia has the same sound effects as Padmé as well as the same animation. Although it changed in the sequel "The Original Trilogy"
A Gameboy Advance version of LEGO Star Wars: The Video Game was created by EIDOS. This version of the game was the only version of the game created that differed in any way rather than small control changes on the different platforms. It was created by a different company, considering that the console-based counterpart could not function based on the Game boy's comparatively diminutive hardware. This version shared no gameplay with the console counterparts. Facts about "LEGO Star Wars: The Video Game"
This page was last edited on 3 November 2018, at 17:38.